Is your microwave getting on in years? Do your Jamie Oliver recipes presume you have better cooking equipment than you actually do? Are your friends out-spiralising you with their fancy string courgette-y spaghetti meals? Or maybe you just think it's time to be one of those people who can pour cold water and ice directly from your freezer door? Well if any of this applies to you, you really need a Kitchen Makeover. Which is lucky... because you can win one here at Aunt Bev's! Entries include a voucher to the Kitchen Makeover room where the draw will take place in the form of a bingo game 7pm Weds 12th Dec! So take a look around your kitchen and start thinking about what you can makeover! 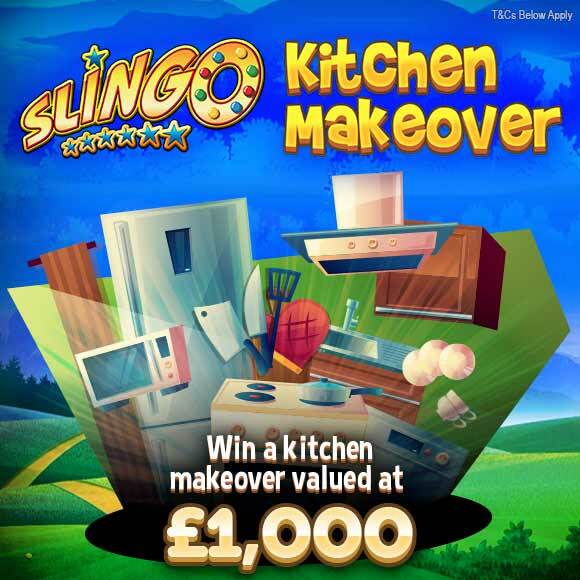 To participate in the Kitchen Makeover promotion, players must have funded during the promotion period. The promotion runs 23 Oct to 09 Dec 2018. To enter the promotion, members must wager £10 on Slingo Rainbow Riches prior to 23:59 09 Dec 2018. Max no. entries per person = 6. Entries to the draw will be credited as bingo ticket vouchers to the Kitchen Makeover Bingo Room with the game being held 7pm Weds 12 Dec 2018. The winner of the Full House will win £1,000 in shopping vouchers. An alternative £1,000 cash prize is available should the winner choose to decline the vouchers prize. In the event of a shared Full House, the value of the prize will be split evenly between winners as cash. We reserve the right to alter or change details of the promotion at any time without notice. For questions regarding the promotion, please contact promotions@auntbevs.com.